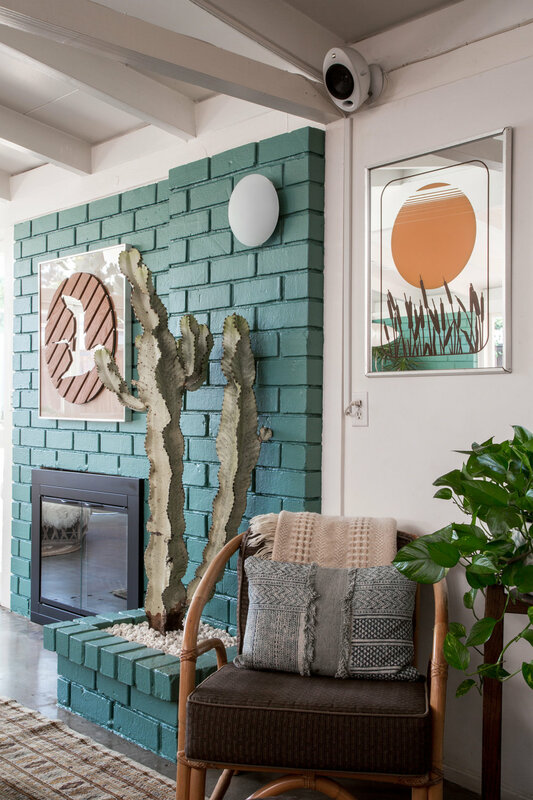 When we first purchased our Cliff May home, there was so much neon color on the walls, my eyes went into instant shock and I immediately went into my "hurry up and paint these walls white!" mode. For years, I continued using pieces of color in the accessories and furniture inside our home, all the while living with a blank slate of color for our walls. My childhood was in an all white house, white carpet, white walls. I kept telling myself, "White is classic. White is clean. White is safe." Earlier this season, Dunn-Edwards, approached me about 6th And Detroit getting a makeover. With color. WHAT? As in, on the walls?? They asked if I would partner up with them in the announcement of their "2018 Color of The Year" by allowing The 6th And Detroit Rancho to participate. When Dunn Edwards told me what the color palate was - it wasn't hard to convince me. They found my weak spot. GREEN. If you have followed me at all for any amount of time, you will see that I have a penchant for all things green. Plants are an obsession of mine. Large, uniquely shaped, stately leaves that fill my store with all the beauty that they can possess. When I shop for the store, finding the emerald glassware I love is equivalent to finding the Wizard of Oz. Looking at the all the variations of my favorite color as options for the store, as well as my home, my designer mind began to swirl. An entirely new door inside my left brain rushed open. I can't even explain what happened once the color actually went on the walls. But I'm getting ahead of myself. I can't wait to show you what happened next. Just wait. Dunn-Edwards showed me swatches of paint. Initially, I had a mini heart attack. Going from white to rich green was a huge move. It's one thing to choose from eggshell or brilliant white. That choice had little consequence. We were talking C-O-L-O-R.
As the white slowly disappeared, I could feel this mood move through me. I can't explain it, it felt like I was looking at my house through a different lens. A new version of my home. The more white that disappeared, the greater my brain worked thinking of new ways to tie in fresh decor into my home. Stephanie, from Peacock & Co., installed a new magnificent cactus to tie in the hue of my couch. Green on green. It was killer. That planter had been stale for so long and she helped find exactly what it needed. Paint: Dunn-Edwards "The Green Hour" DET544. Dining Table + Chairs: Good Modern. Bubble Lamp Pendent: Modernica. Art: The Bohemian General. Plants + Macrame Plant Hanger: Peacock & Co. Pot: ..... Rug: 6th And Detroit. Just look at how the The Green Hour hits our dining room with such an impact. I freshened up the wall with new artwork, a new dining table and chairs, and a warm rug from my own shop. Changed the entire feel of the room. Artwork: American Standard Supply Co. Dresser: 6th And Detroit. Hat Rack: Maven Collective. Leather Backpack: Marloe. Wool Hanging: Iron & Wool. Hat: Anneise. Chair: 6th And Detroit. Macrame Plant Hanger: Peacock & Co. Bedspread + Throw: Hamamlique. Bench: Homegoods. Lamps: Modernica. Bed + Plant Stand: 6th And Detroit. Pillows: My Haven Home. Bedspread: Hamamlique. Plants: Peacock & Co. Mirror: The White Elephant Co. Shelf: CCC Vintage. Rug: 6th And Detroit. The Green Hour continued throughout the guest room and into the master bedroom. 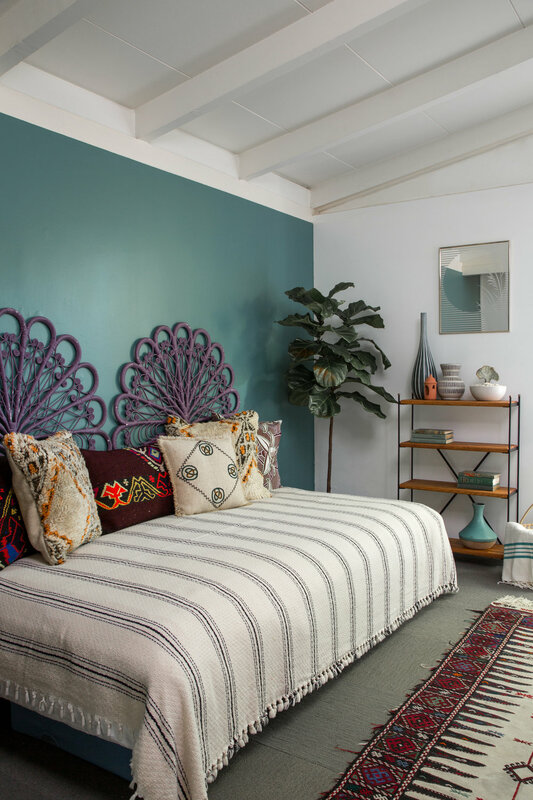 The nuances of the paint were subtle when applied to my bedroom, but worked well to bring new life to the space complimenting my beloved bamboo wallpaper. Fiber Art: CCC Vintage. Painted Sun Mirrors: 6th And Detroit. Plants: Peacock & Co. 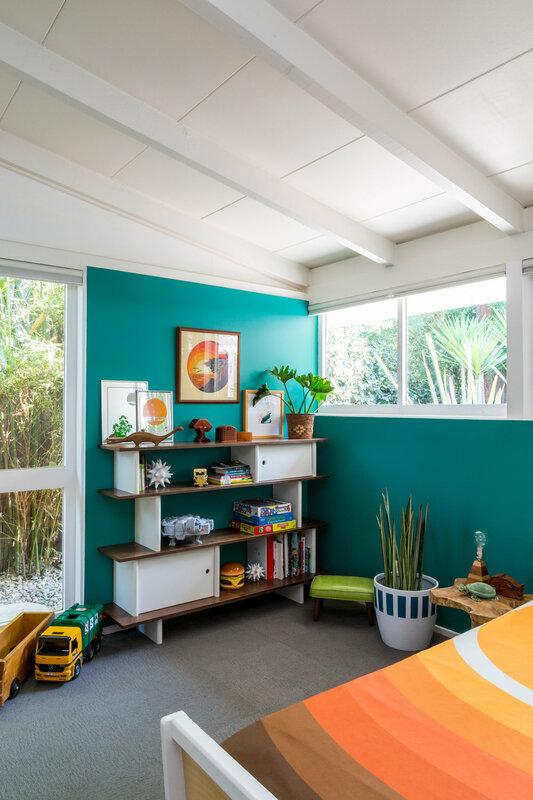 The transformation that happened in Hamilton's room was surprising. EVERYTHING in his room looked fresh. The color is called, Royal Palm, and royal it is. When Hamilton came into his room, his face just lit up like I had bought him a brand new Lego set! Little brother, Davis, was just as excited and immediately claimed that the two of them were now to be roommates. I didn't even have to try. Thank you, Dunn-Edwards for that win! Bringing color into our home brought newness and fresh ideas. The excitement that my boys had for their "new" room was exactly how I wanted to react. And maybe I did just that holding a cheshire grin throughout the halls. Grateful for the team at Dunn-Edwards that so professionally executed the transformation of our home. The laughs, the behind the scene antics, they were so encouraging that it made the transition fun. Which is something that I needed to be reminded of in this season of our life. Transition can be hard, but with the right people around, it can also bring a little bit of fun.